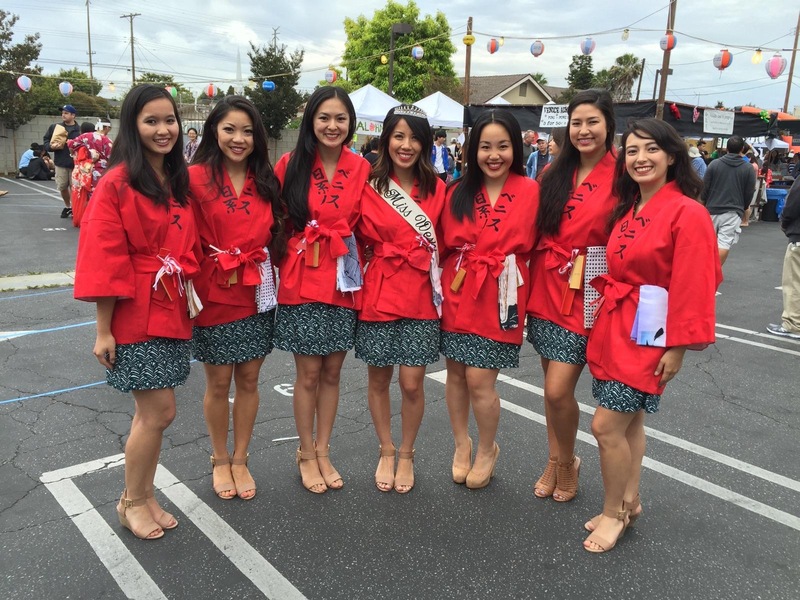 One of JANM’s own staff members, Events Assistant Camryn Sugita, was selected as a queen candidate for the 2015 Nisei Week Japanese Festival, representing the Gardena Evening Optimist (GEO) club. She has agreed to do a series of occasional blog posts about her experience, offering insight into the Nisei Week Court process and what it means for the princesses and the community at large. Read her first entry here. Camryn Sugita, center, is crowned Miss GEO 2015. 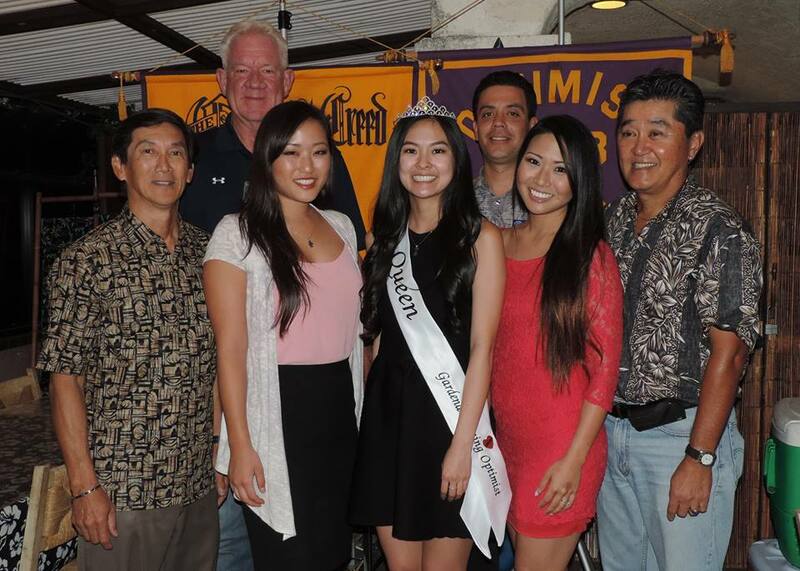 Surrounding her are four members of the GEO club, along with 2014 Nisei Week Princess Tiffany Hashimoto (left) and 2008 Nisei Week Queen Jill Hiraizumi (right). A couple of days after I submitted my application, I received an email confirming my interview. The interview only lasted 30 minutes with a panel of six interviewers. I was told I would hear back the next day about whether or not I was selected. After what seemed like the longest day of my life, I finally received an email at 4 p.m. The first two lines read, “Thank you so much for taking the time to apply and interview for the Miss GEO candidate position. It was very nice interviewing you and getting to know you.” I immediately thought I hadn’t been selected. Then in the second paragraph it stated, “You were selected as the 2015 Miss GEO!” My jaw dropped and I screamed, which probably wasn’t a good idea since I was working at JANM’s front desk at the time. I couldn’t wait to tell my family, friends, and co-workers, who had all encouraged me throughout the interview process. A week later, I had my crowning at Cherrystones restaurant in Gardena, where I was able to meet members of GEO and give my first, very rough, speech. It was a night to remember! The 2015 Nisei Week Court at queen candidate Michelle Hanabusa’s crowning as Miss Western Los Angeles at the Venice Hongwanji Obon Festival. At the end of April, I attended the Nisei Week Queen Candidate orientation with my parents, where I met the other girls and our advisors, the Queen and Court Program Committee. Less than a week later, we had our first training session: kimono rehearsal, in which we learned how to properly put on, walk in, and fold a yukata (casual summer kimono). Some of us had a hard time at first, but now we can all put them on with ease. Since June, we’ve been meeting at least three times a week for various classes and trainings. The sessions are three to four hours long and have included odori (Japanese dance) rehearsals, modern dance classes, etiquette training, professional development, and a variety of cultural lessons. Many hours are devoted to practicing our introductions and learning to walk properly in heels. My favorites, however, are the cultural lessons. The first one was in basic karate—by the end of the lesson, we were each able to break a board in half! All of these classes prepared us well for our first big event—the Nisei Week Japanese Festival Opening Ceremony on July 19. At this official kickoff, we all gave our introductions and were presented as candidates for Nisei Week Queen. But the fun doesn’t stop there! We still have lots of trainings to go before Nisei Week. Nisei Week takes place August 15–23. The new Nisei Week Queen will be selected at the coronation ceremony on August 15. Who will be crowned? Visit niseiweek.org for more information, and stay tuned to this blog for more diary entries!